Iain Baxter& (born Iain Baxter, he legally change his name in 2005) is a pioneering Canadian conceptual artist. He is currently Professor Emeritus at the University of Windsor’s School of Visual Arts. Baxter& was born in Middlesbrough, England on November 16, 1936. His family immigrated to Calgary, Canada in 1937. He attended the University of Idaho, where he received a BSc in Zoology in 1959 and his Masters of Education in 1962. Baxter& studied art and aesthetics theory in Japan in 1961, and completed a MFA at Washington State University in 1964. In 1966 he was the first artist to adopt a corporate persona: the N.E. Thing Company (NETCO). The Company disbanded in 1978. Baxter& has worked in various roles at the University of Windsor. He began as an Associate Professor in 1988, acted as the Director of the Visual Arts Department from 1996-1997, and was appointed Professor Emeritus in 2002. The artist has received a number of honours and awards. 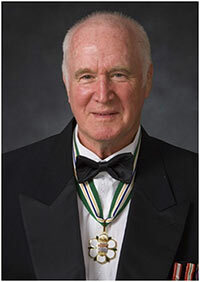 He was appointed an Officer of Canada in 2003, received the Governor General’s Award in Visual and Media Arts in 2004, was inducted as a Member of the Order of British Columbia 2007, and was appointed a Fellow of the Royal Society of Canada in 2013. Baxter, Iain. Iain Baxter: Products, Place, Phenomenon. Art Gallery of Windsor. 1998. Baxter&, Iain. Iain Baxter& C.V. York University Library. Jan. 15, 2011. Web. Accessed Feb. 13, 2018. Baxter&, Iain. Passing Through: Iain Baxter& Photographs, 1958-1983. Art Gallery of Windsor. 2006. Baxter&, Iain. Start Viewing. University of British Columbia Fine Arts Gallery. 1993. “Iain Baxter&.” CCCA Canadian Art Database. Web. Accessed Feb. 13, 2018. “Iain Baxter&.” Canadian Encyclopedia, The. Web. Accessed Feb. 13, 2018. “Iain Baxter&.” University of Windsor Visual Arts Faculty. Web. Accessed Feb. 13, 2018. “Iain Baxter&.” Ruins in Process: Vancouver Art in the Sixties. Web. Accessed Feb. 13, 2018.